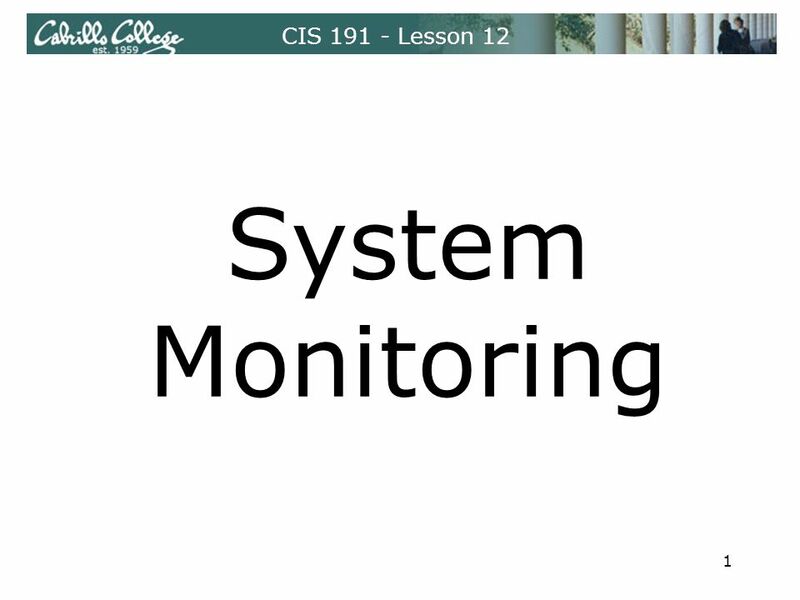 CIS 191 - Lesson 12 System Monitoring 1. 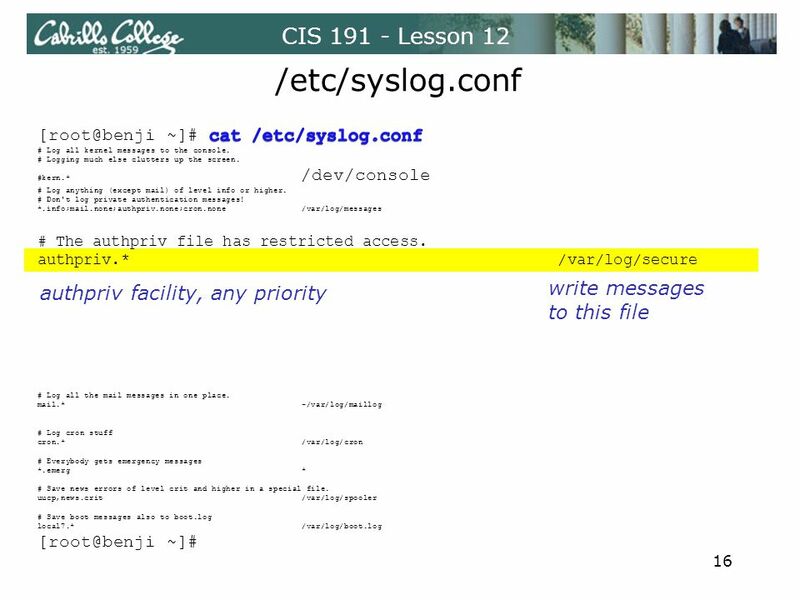 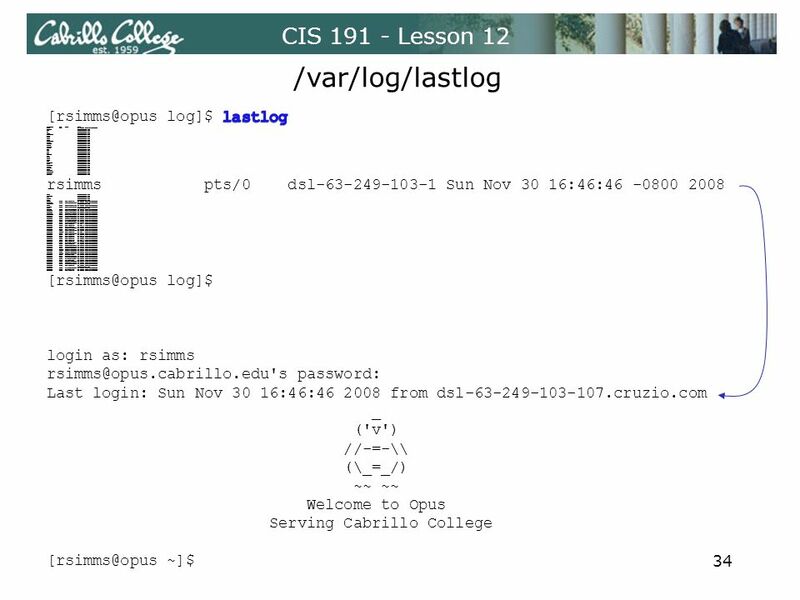 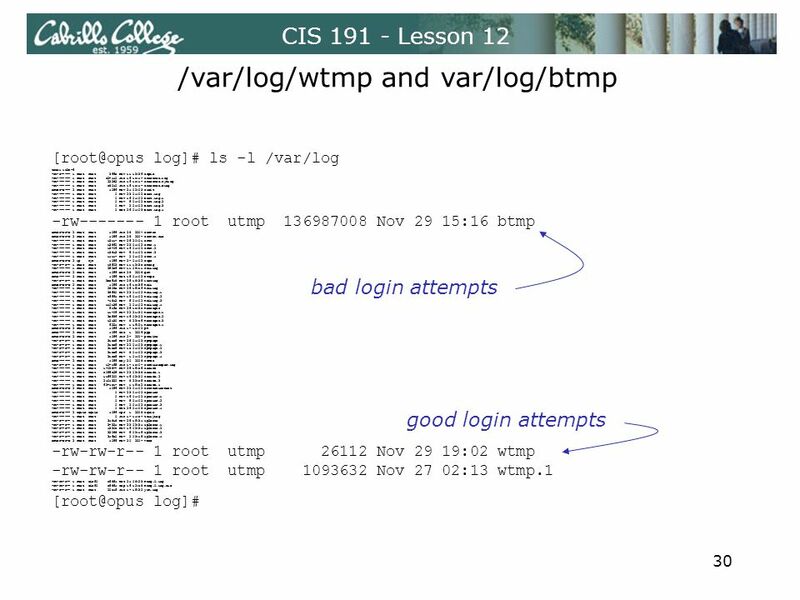 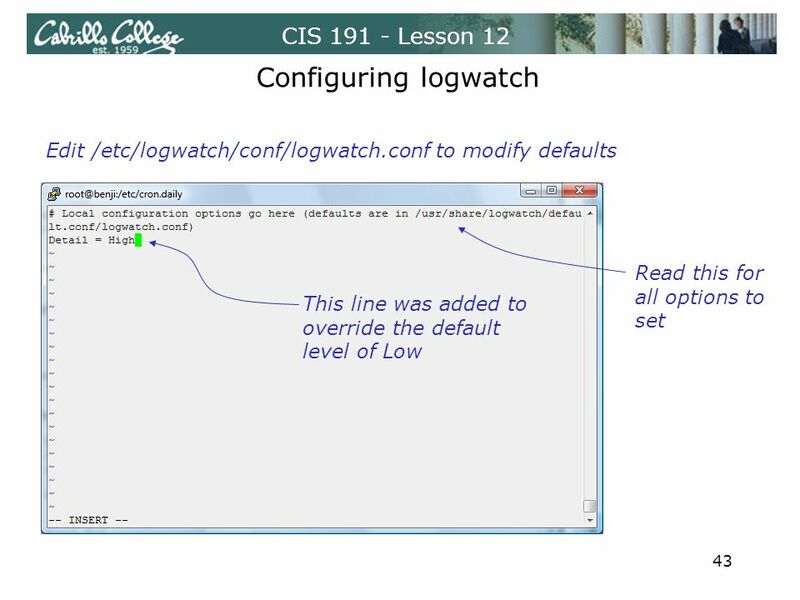 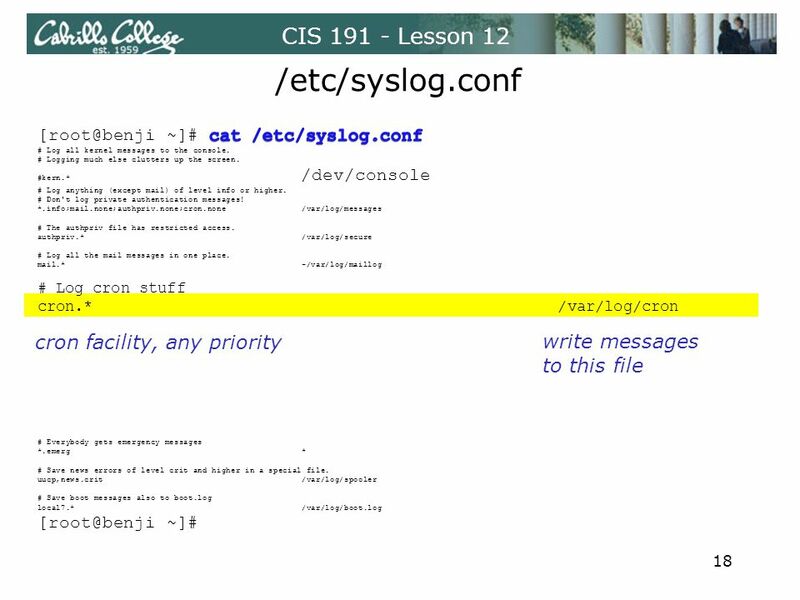 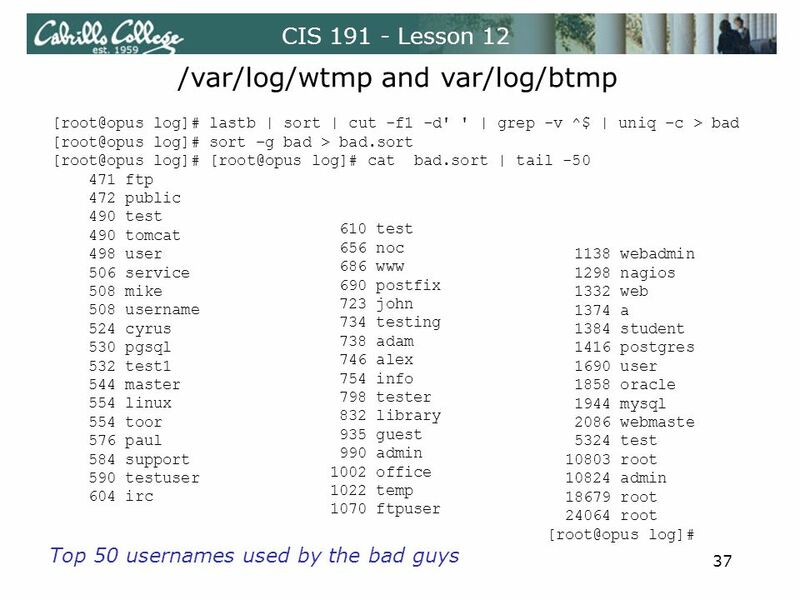 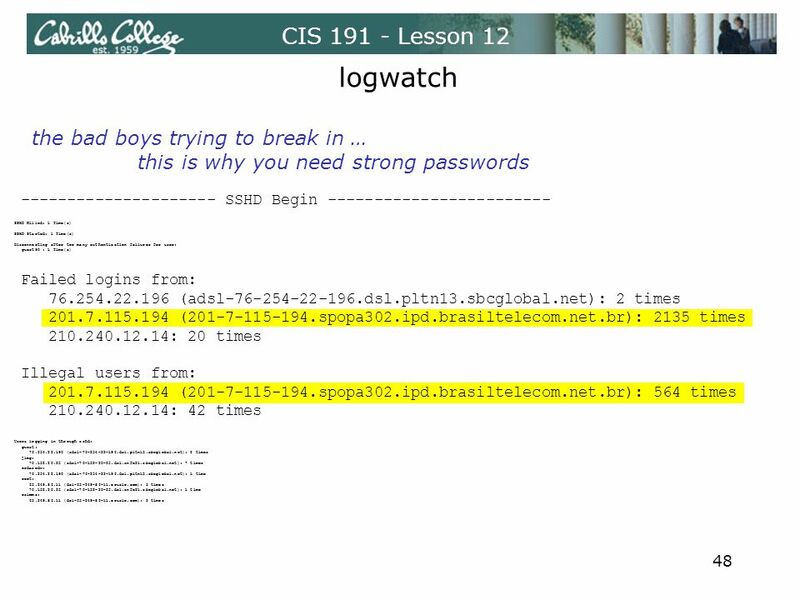 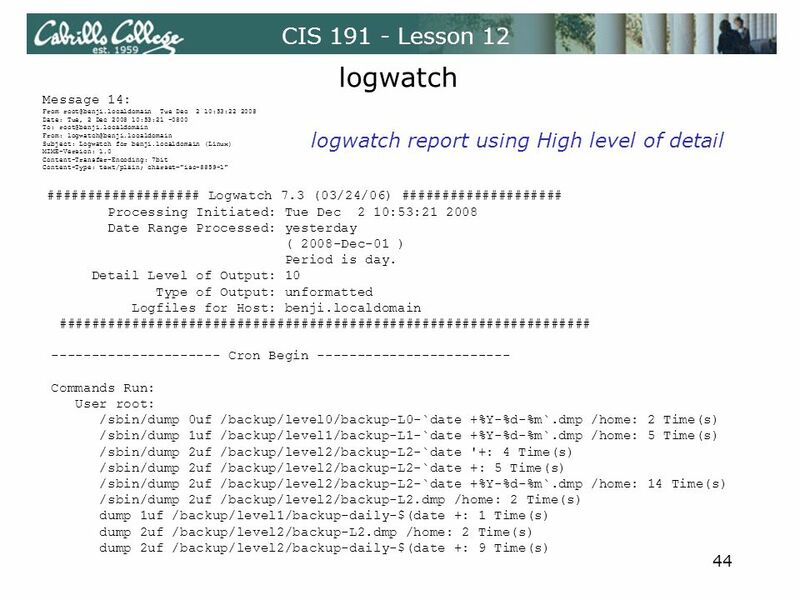 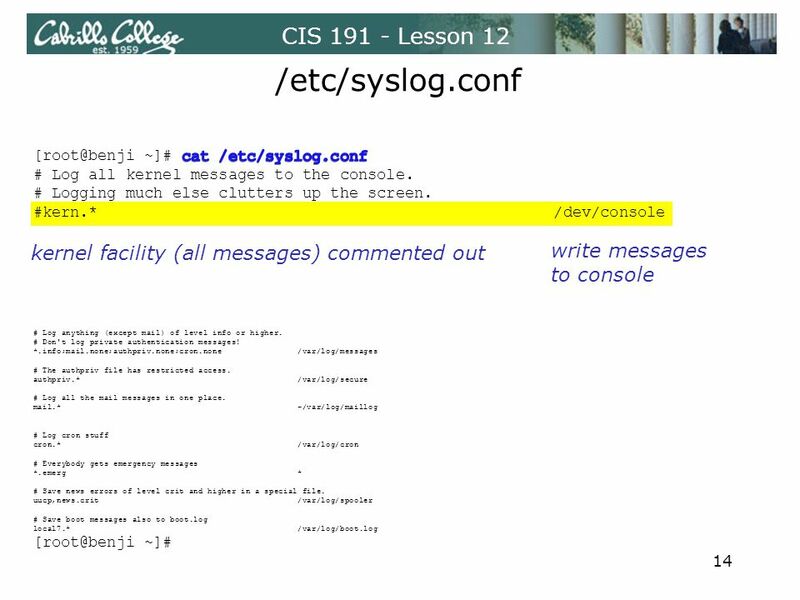 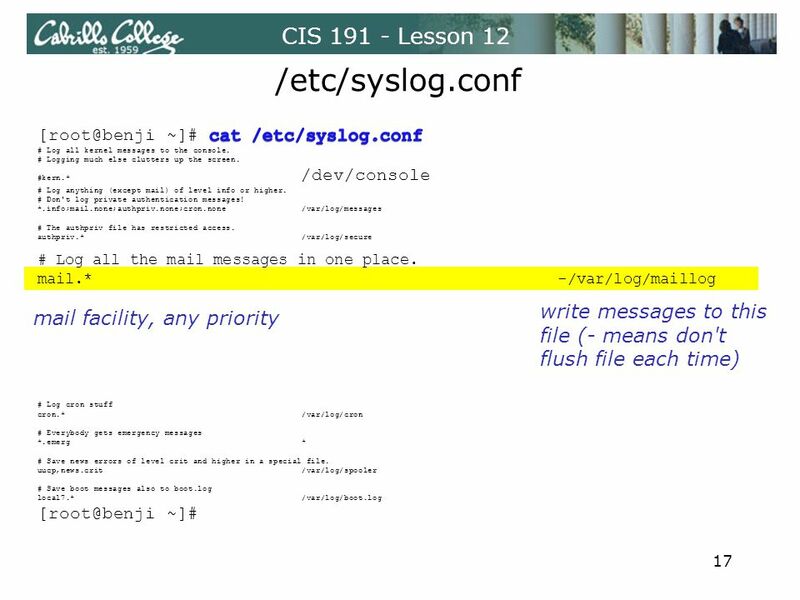 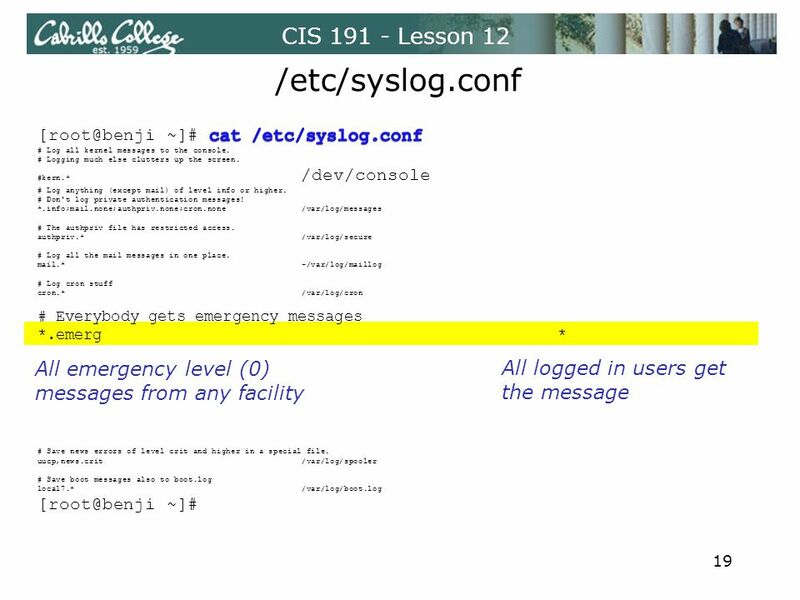 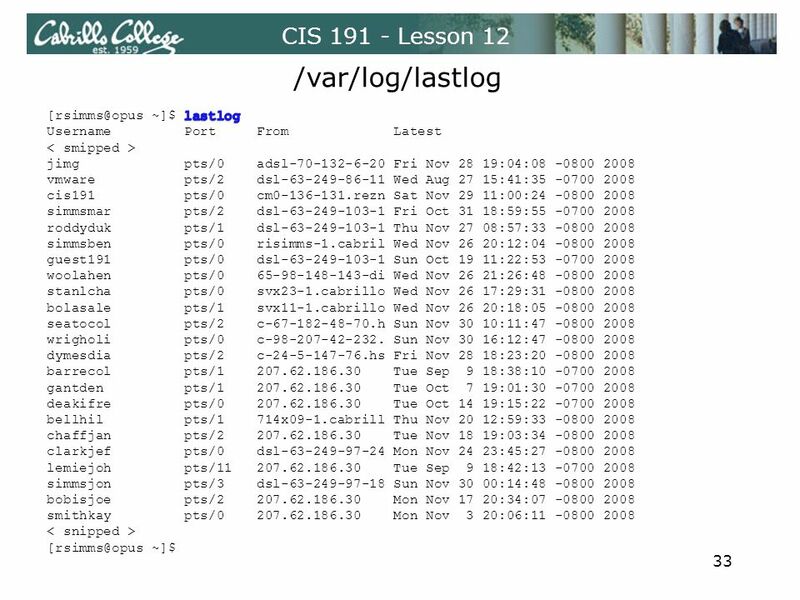 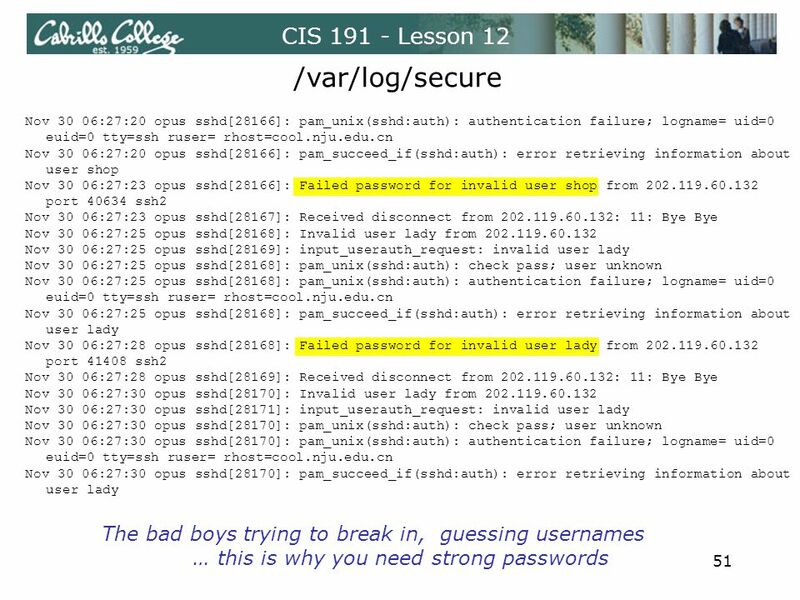 CIS 191 - Lesson 12 System Monitoring Monitoring Log Files /var/log ‒ Can be used as indication of systematic. 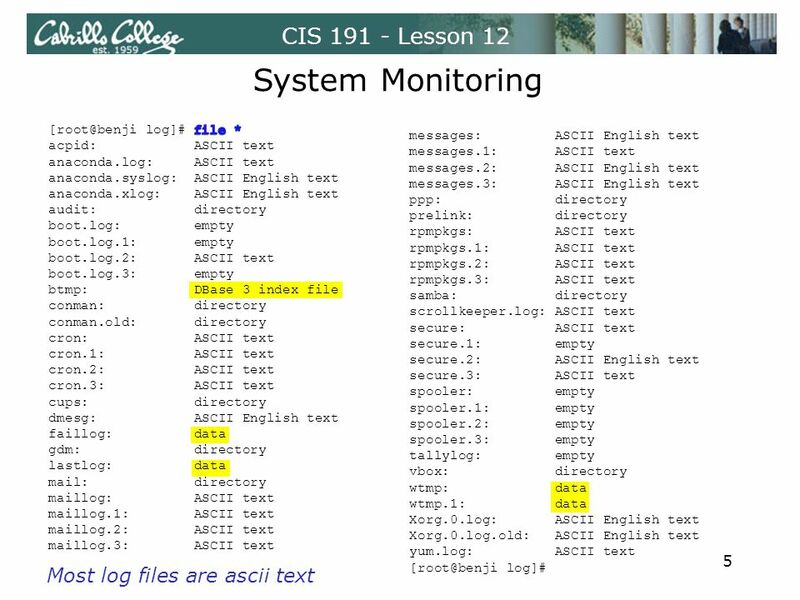 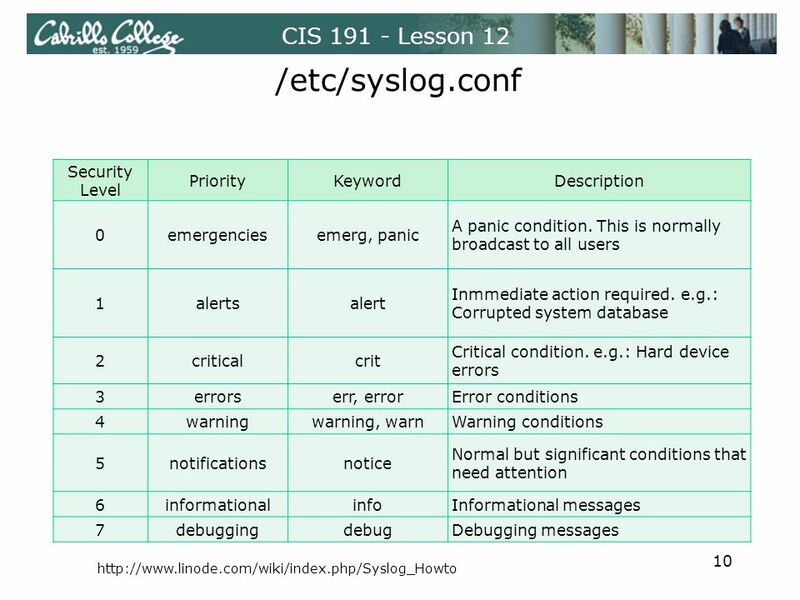 Download ppt "CIS 191 - Lesson 12 System Monitoring 1. 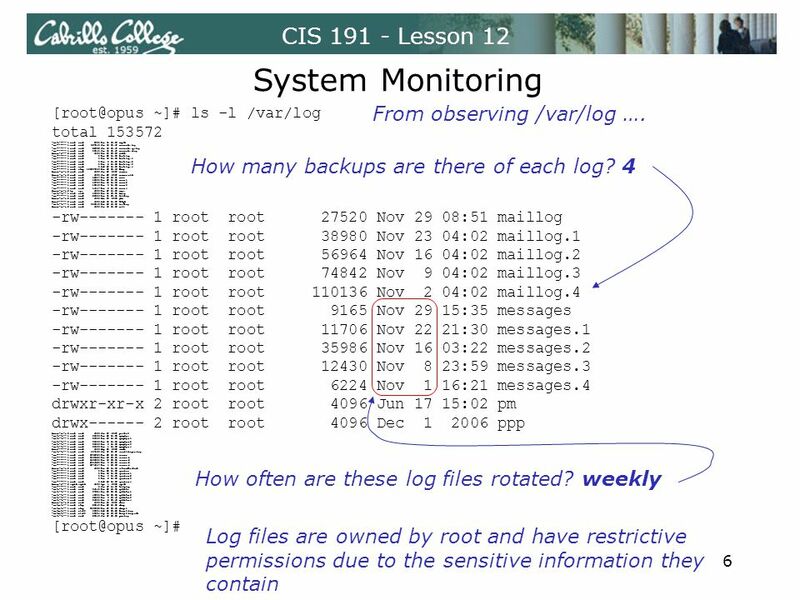 CIS 191 - Lesson 12 System Monitoring Monitoring Log Files /var/log ‒ Can be used as indication of systematic." 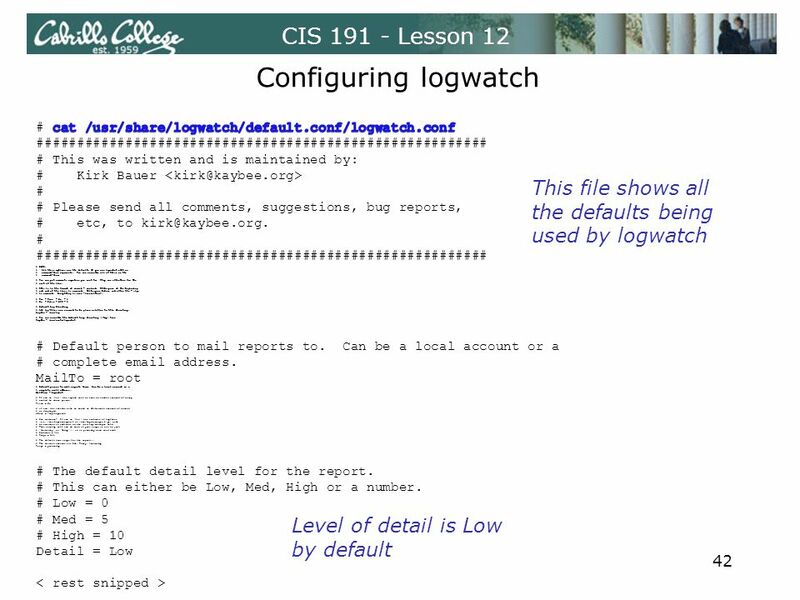 Managing logs with syslog-ng and SWATCH AfNOG 11, Kigali/Rwanda. 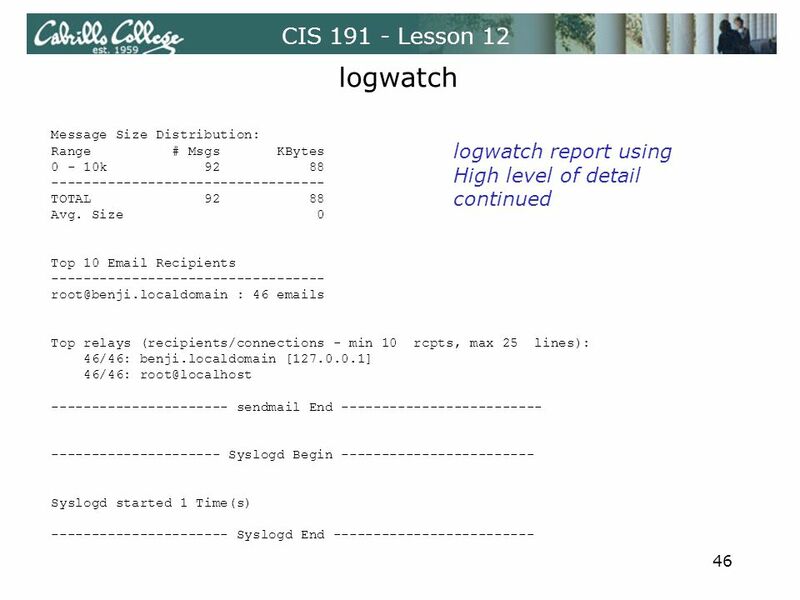 NetComm Wireless Logging Architecture Feature Spotlight. 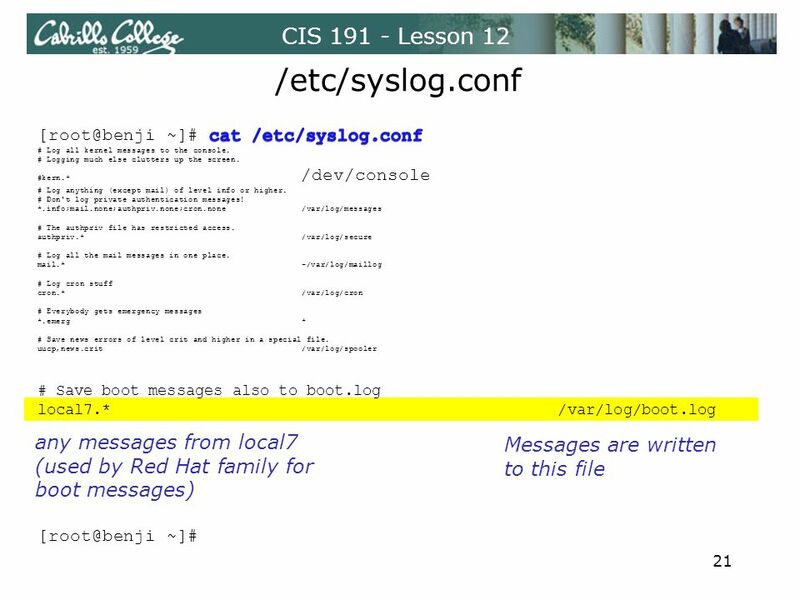 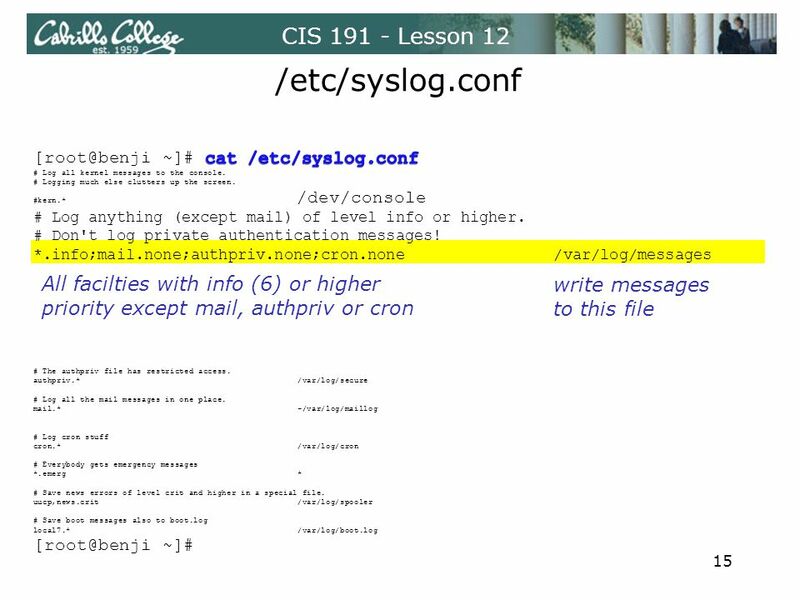 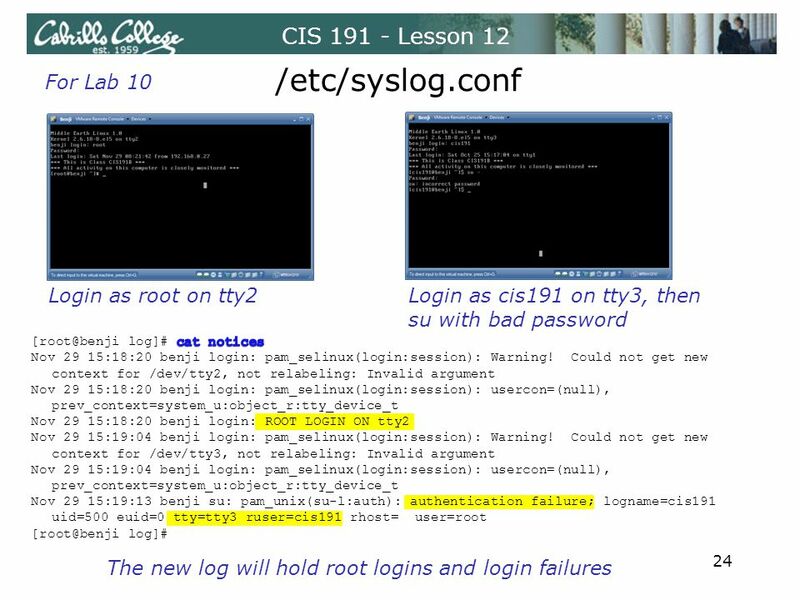 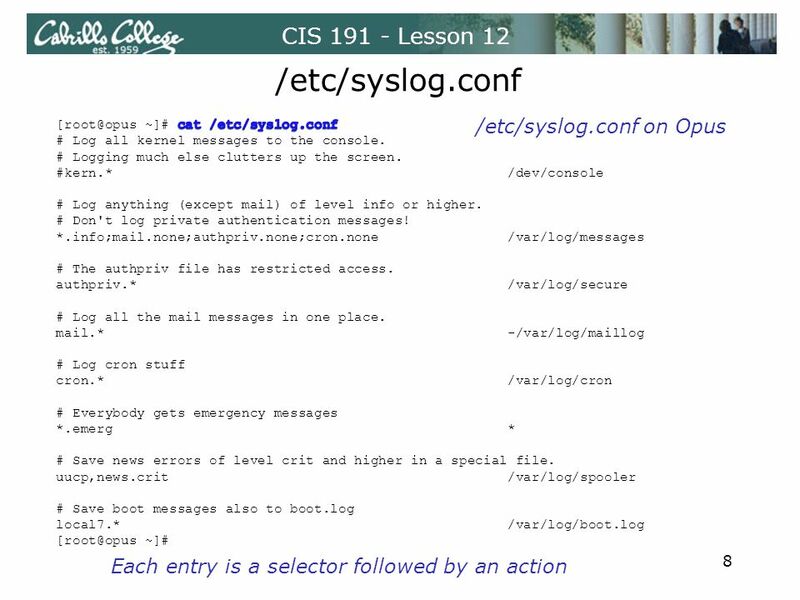 Syslog and log files1-1 Syslog and Log Files  From logfiles, you can find m important information m History m Errors/warnings  Logging policies m Reset. 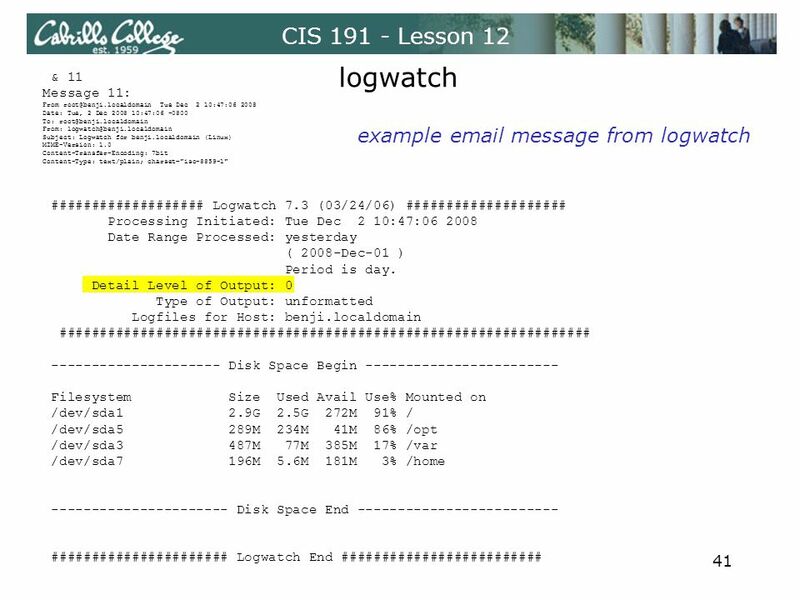 Detecting Intruders from log files and traces Special Intruder Detection Systems (IDS) are now a market niche, and there are many products on the market. 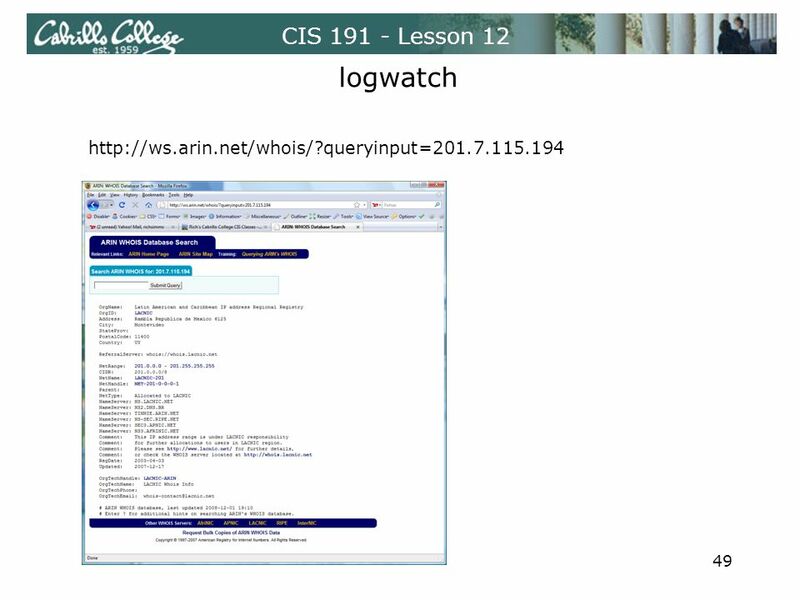 CIS 193A – Lesson3 Vigilance! 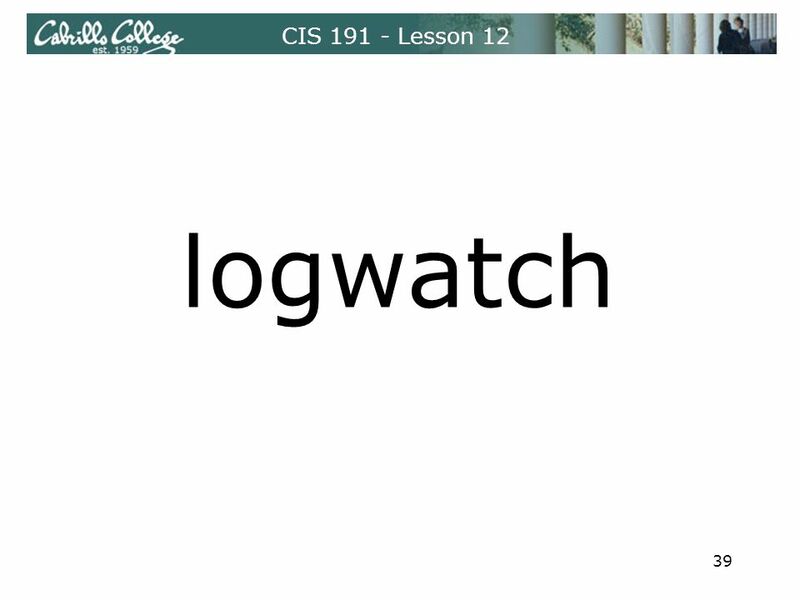 Logging & Monitoring Syslog Logrotate Logwatch Accounting. 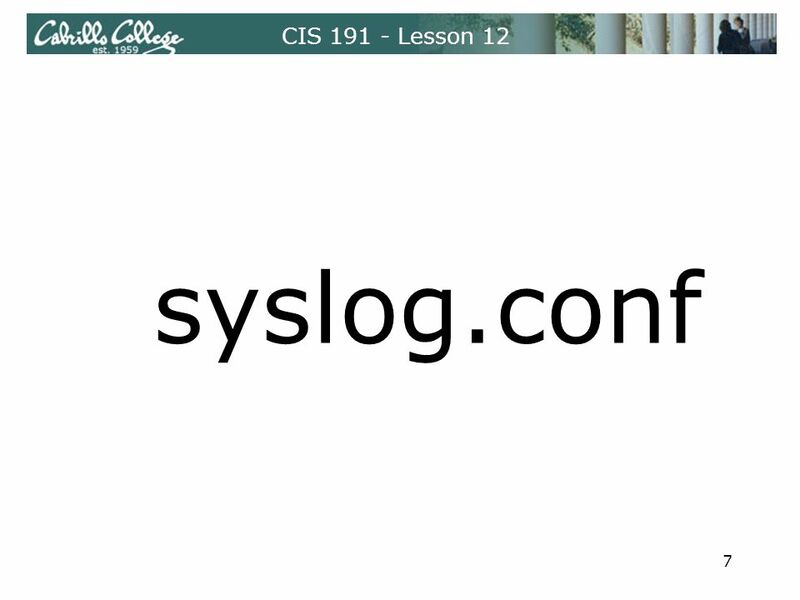 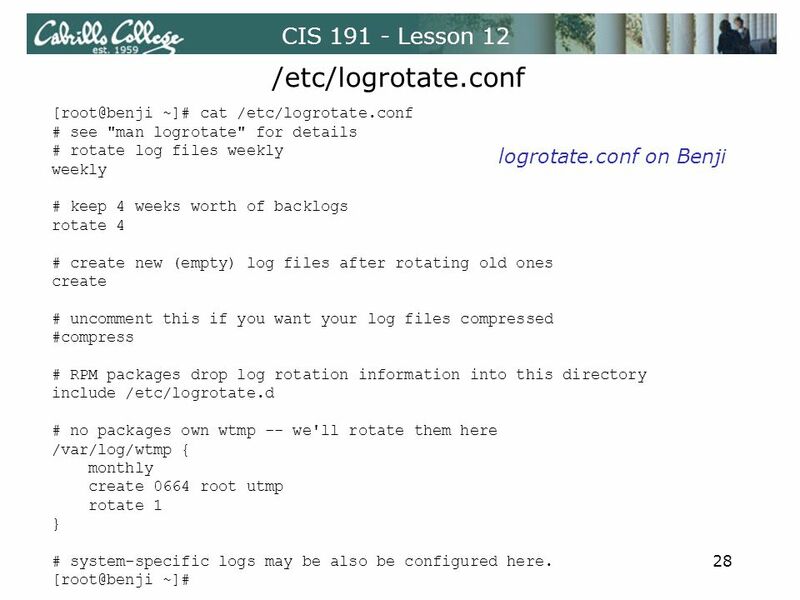 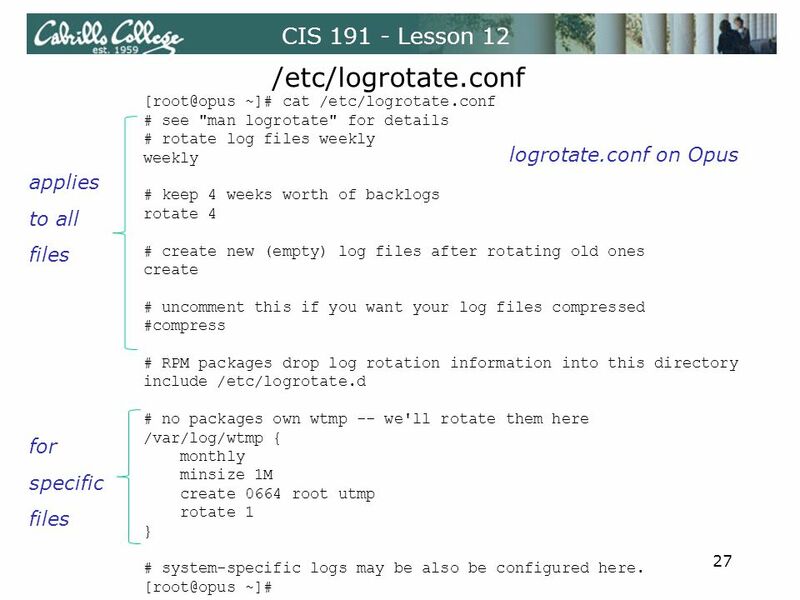 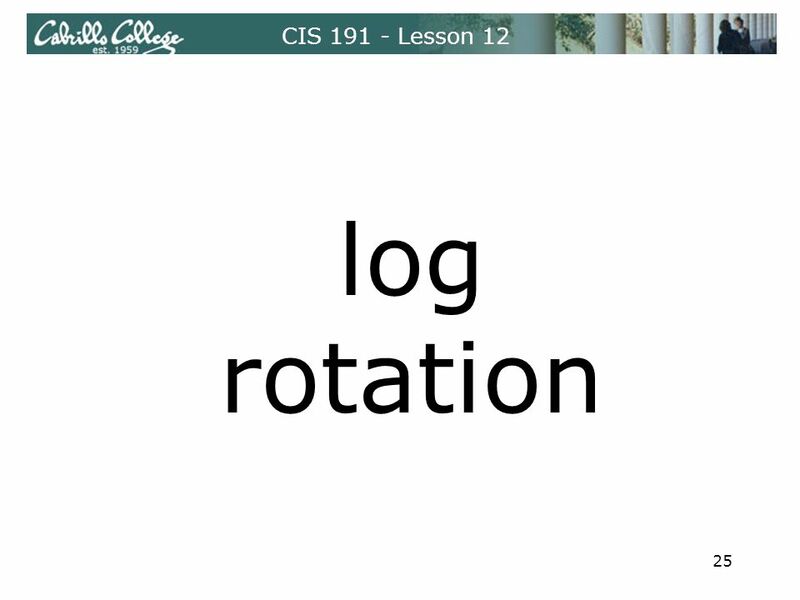 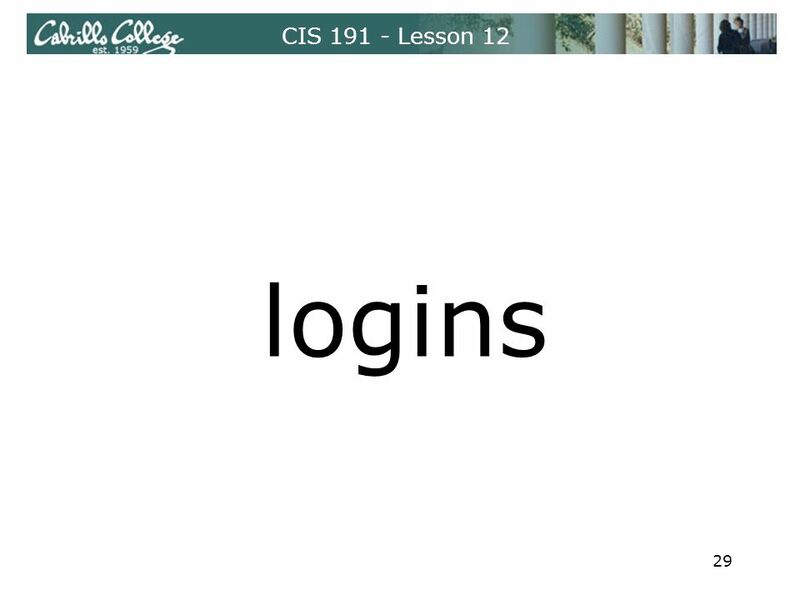 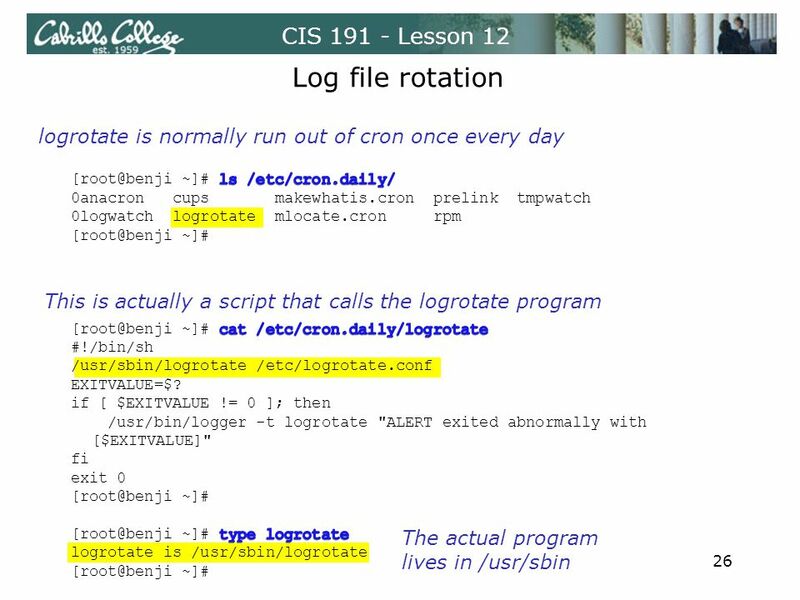 Chapter 11 Syslog and Log Rotate. 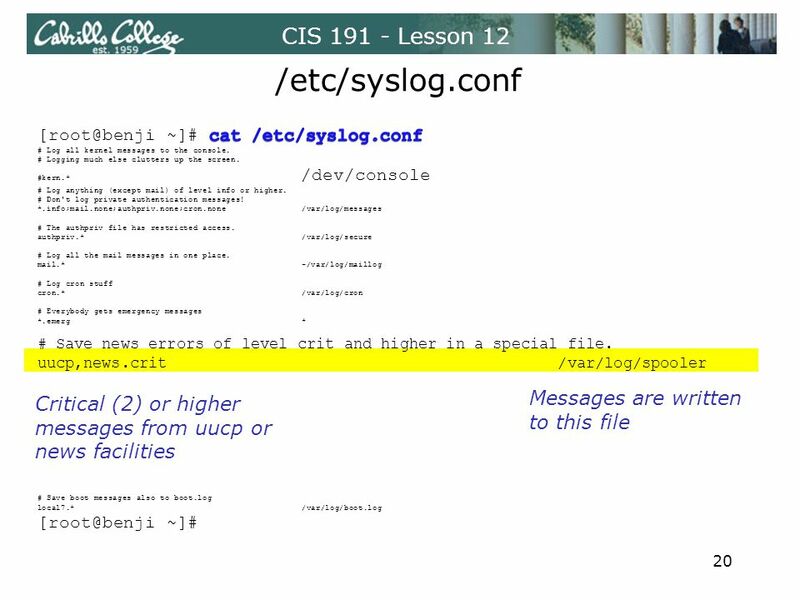 Computer Center, CS, NCTU 2 Log files  Execution information of each services sshd log files httpd log files ftpd log. 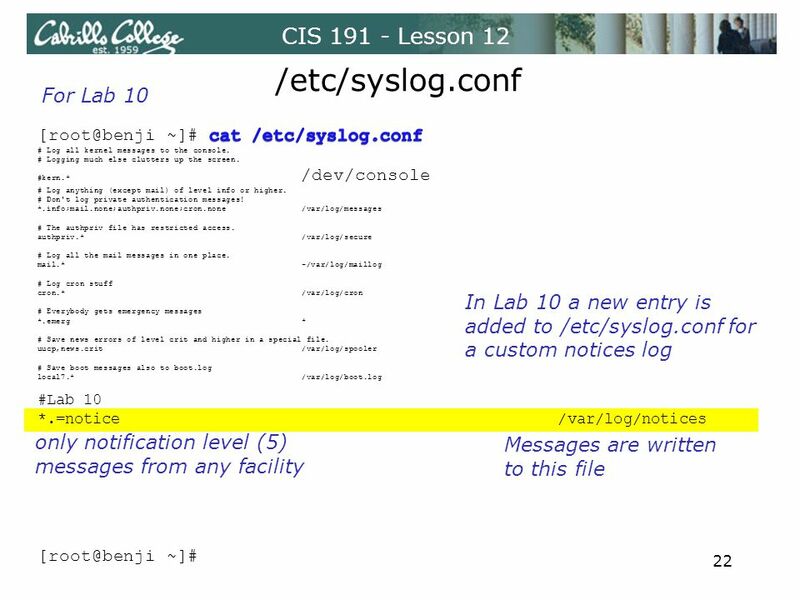 Syslogd Tracking system events. 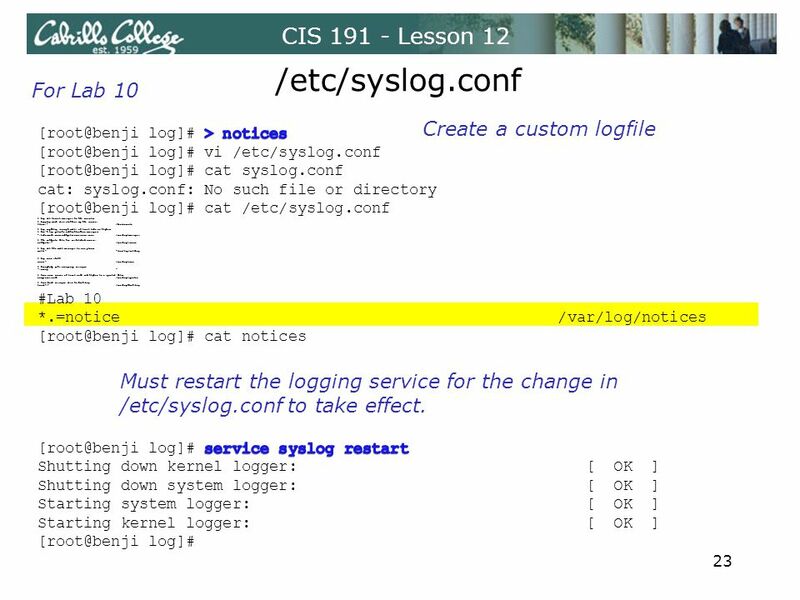 Log servers Applications are constantly encountering events which should be recorded –users attempt to login with bad. 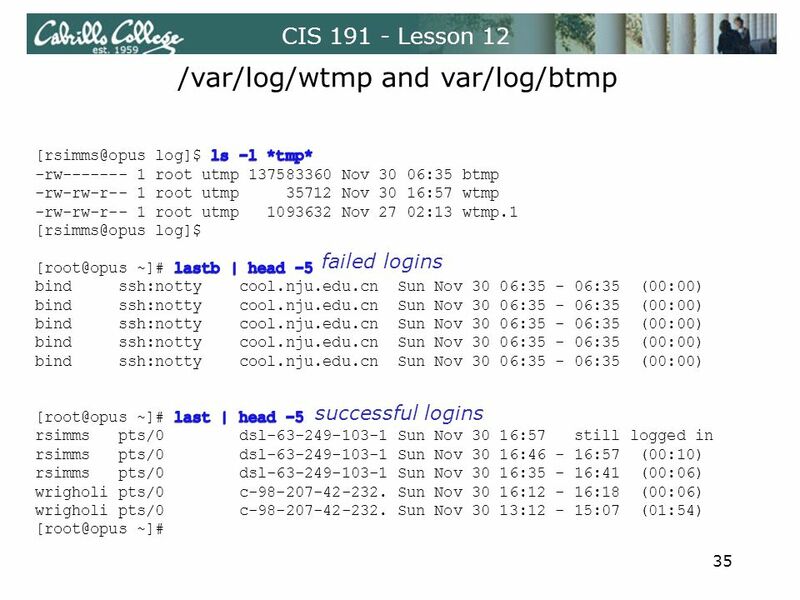 Unix Network Programming Chapter 13: Daemon processes and the inetd superserver Jani Peusaari. 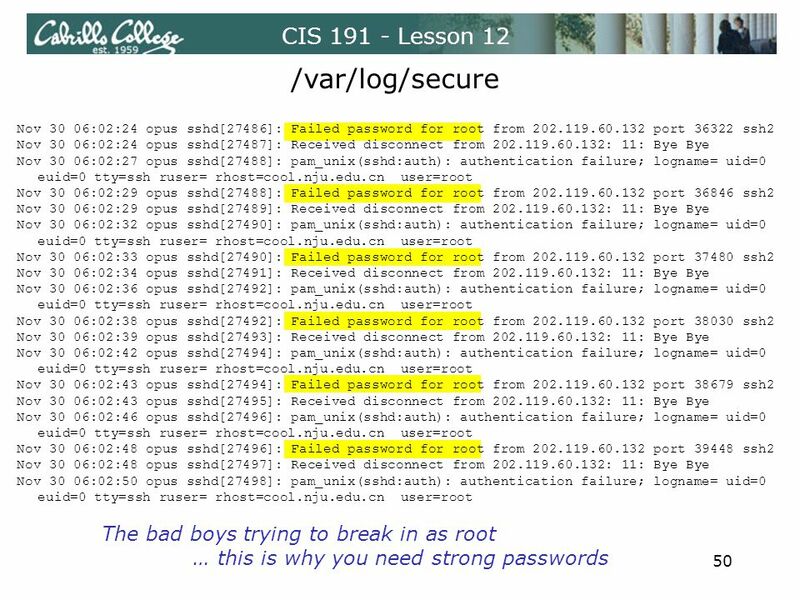 Information Networking Security and Assurance Lab National Chung Cheng University Investigating Unix System. 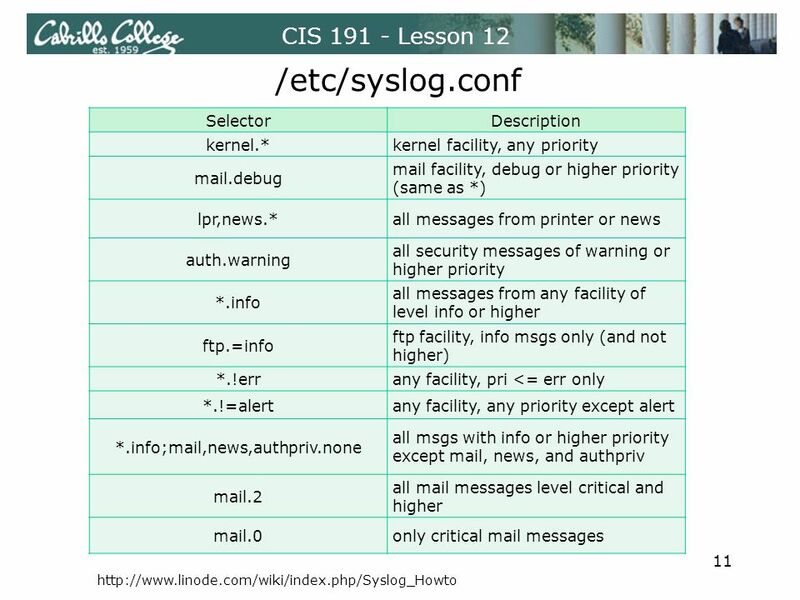 Chapter 3 Unix Overview. 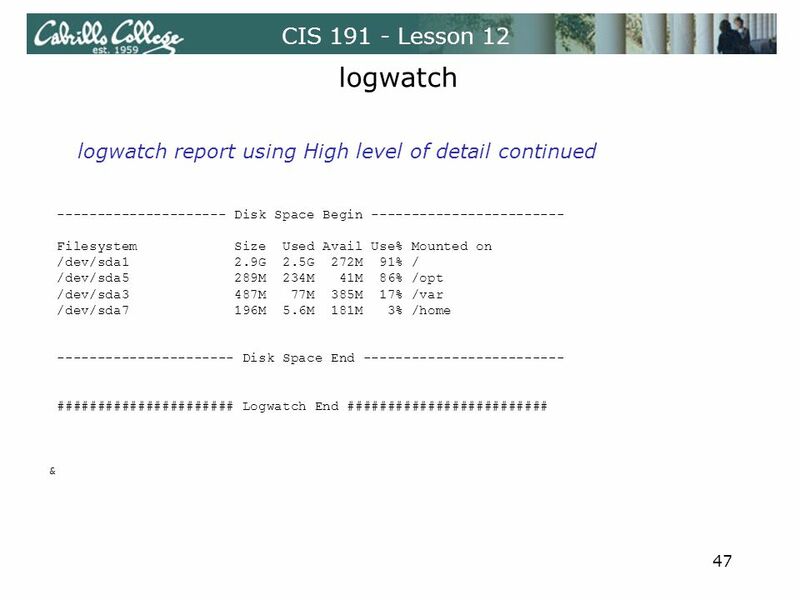 Figure 3.1 Unix file system. 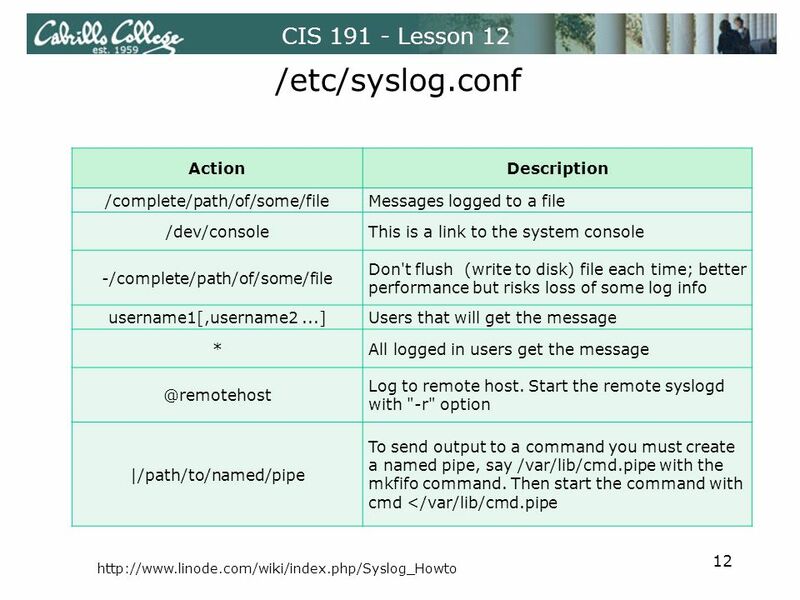 Linux Networking CIS Why Linux/Unix? 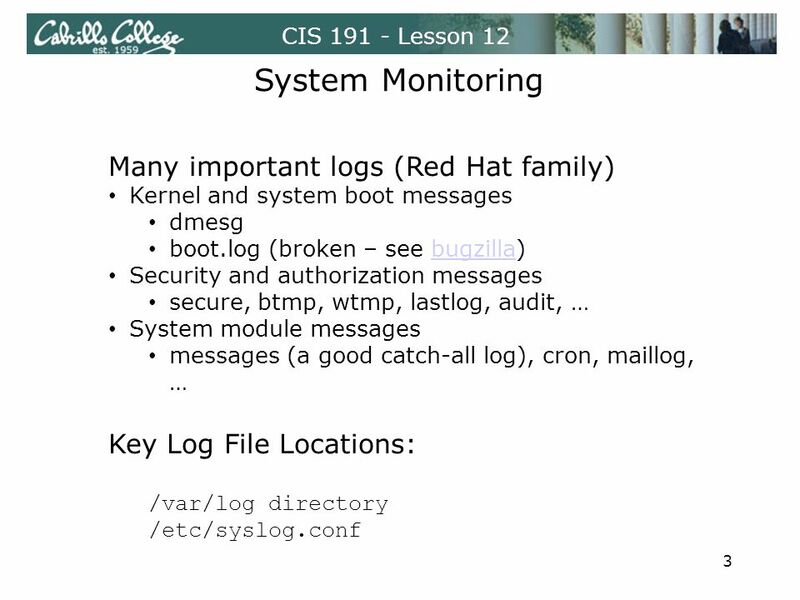 Configurability ▫Customizable System to satisfy unique needs. 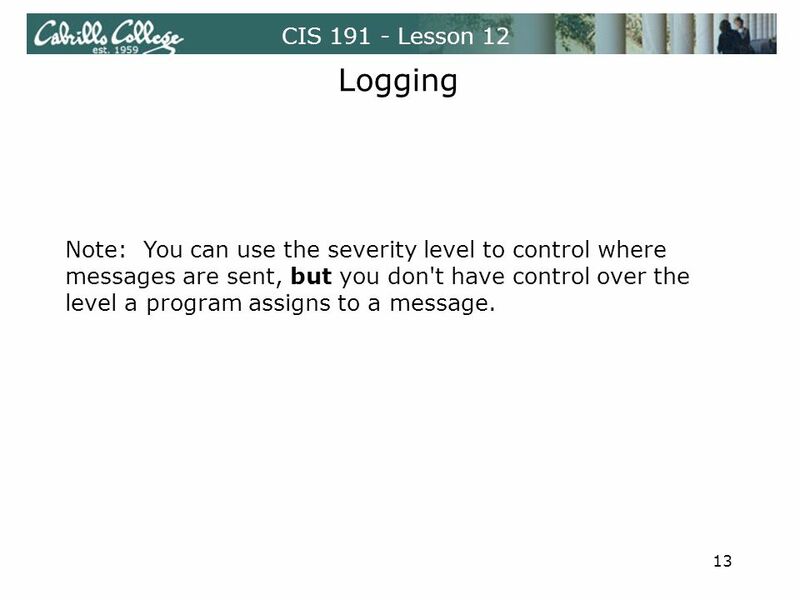 Scalability ▫Able to serve an increasing number. 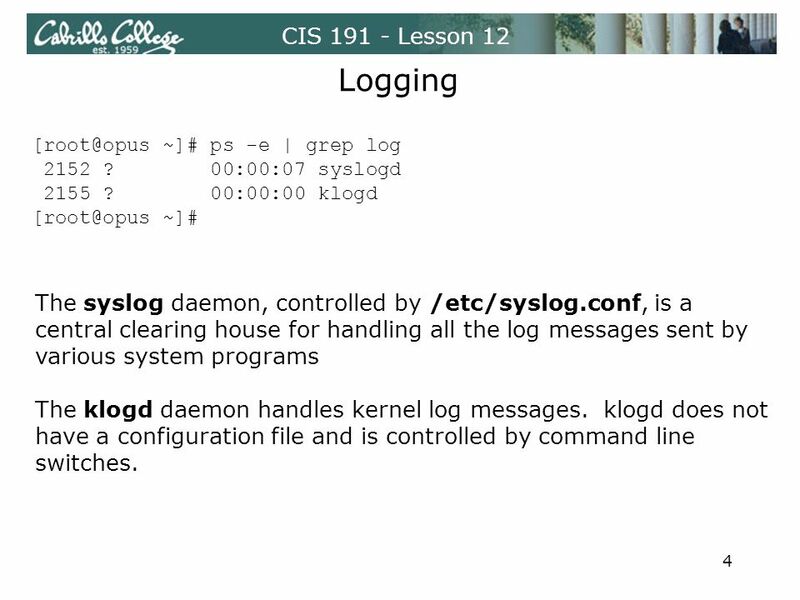 NOC TOOLS syslog AfNOG Cairo, SI-E, 2 of 5 Sunday Folayan. 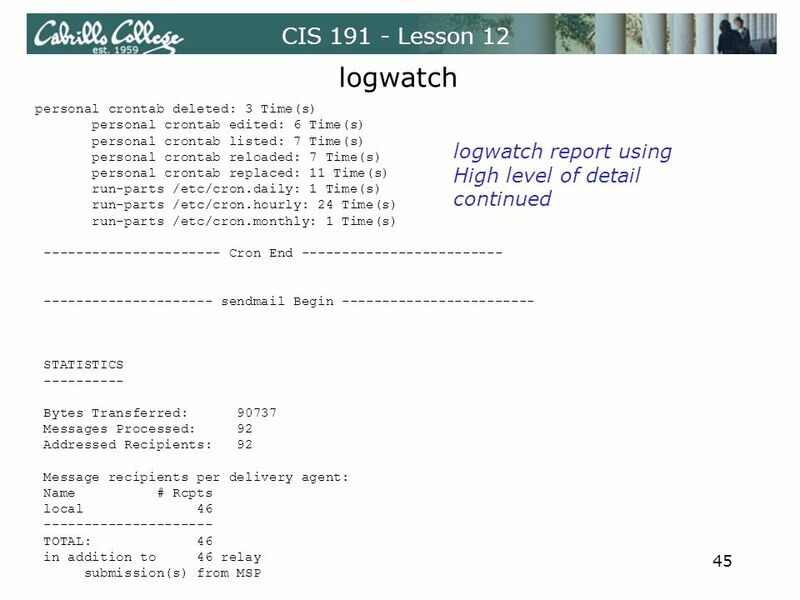 AfChix 2011 Blantyre, Malawi Log management. 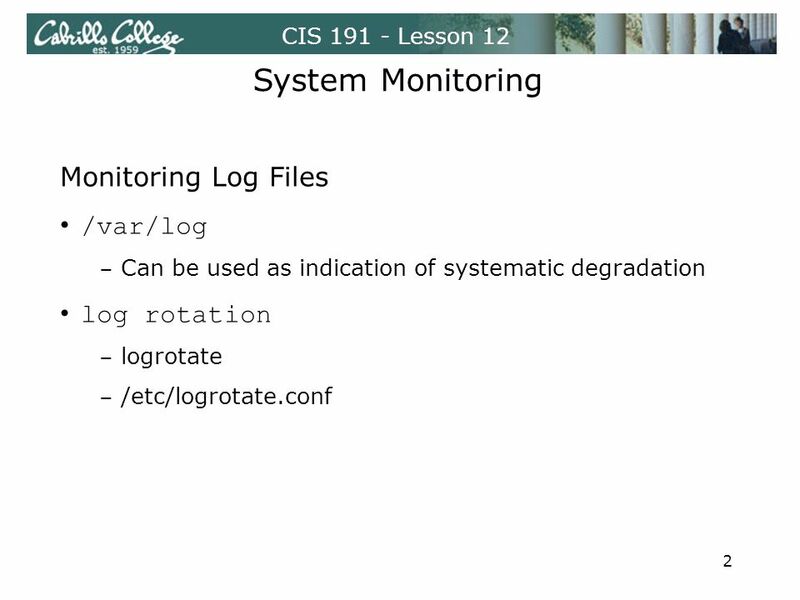 Log management and monitoring ■ What is log management and monitoring ? 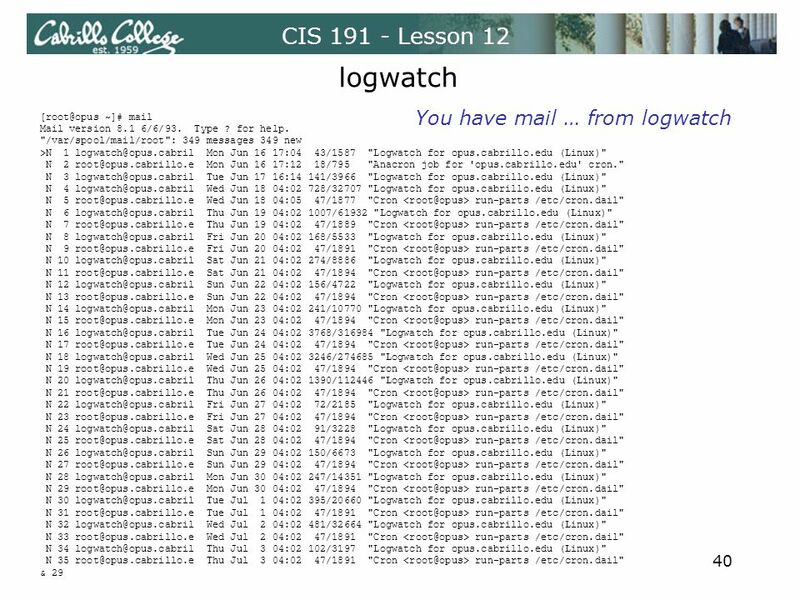 ● It's about keeping your logs in. 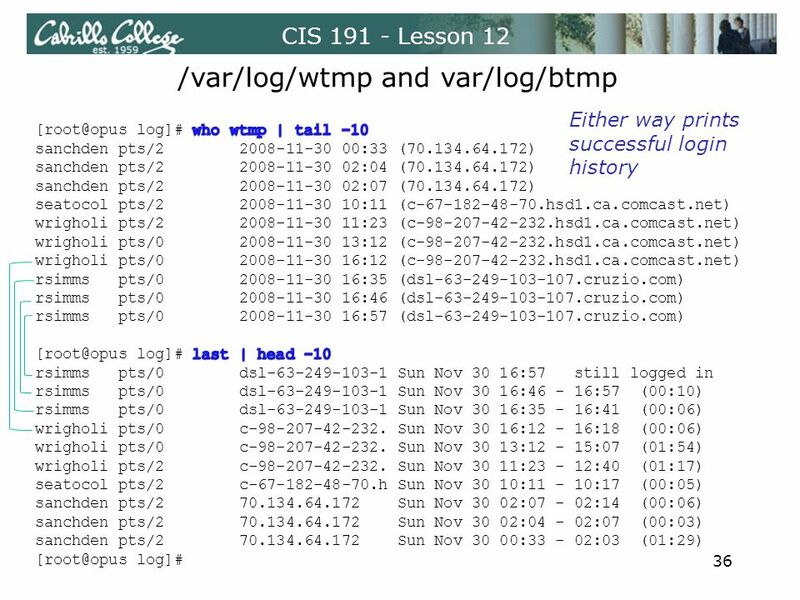 Linux Networking and Security Chapter 10 File Security. 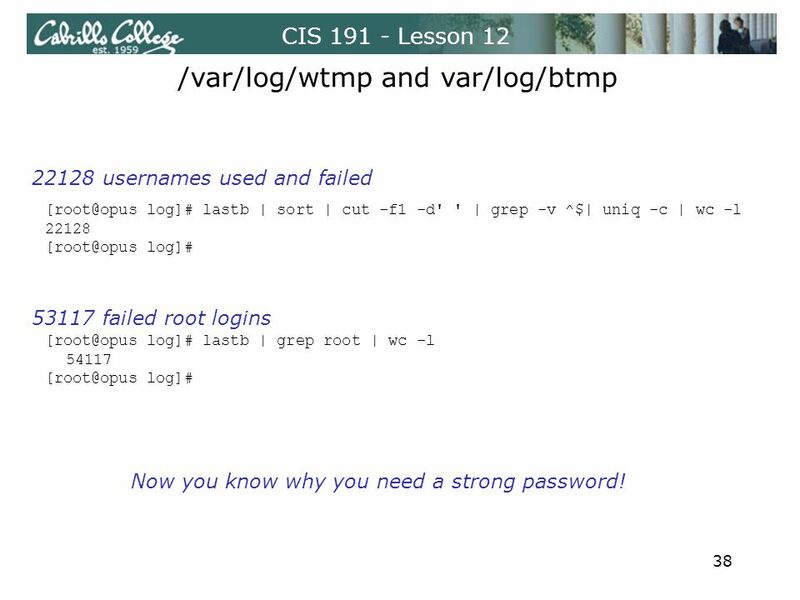 Unix Security. 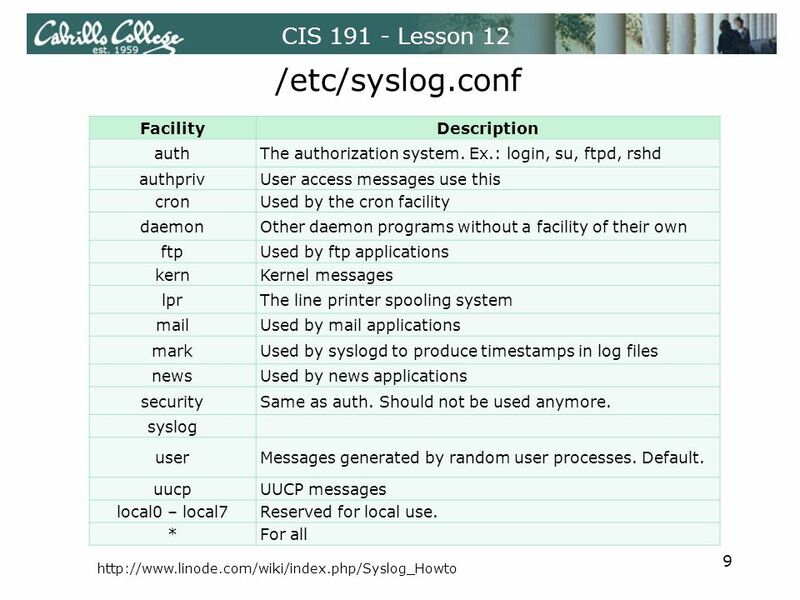  Security architecture  File system and user accounts  Integrity management  Auditing and intrusion detection.